1. Mix together oil, vinegar, honey, lemon juice, salt and pepper to make dressing. 2. 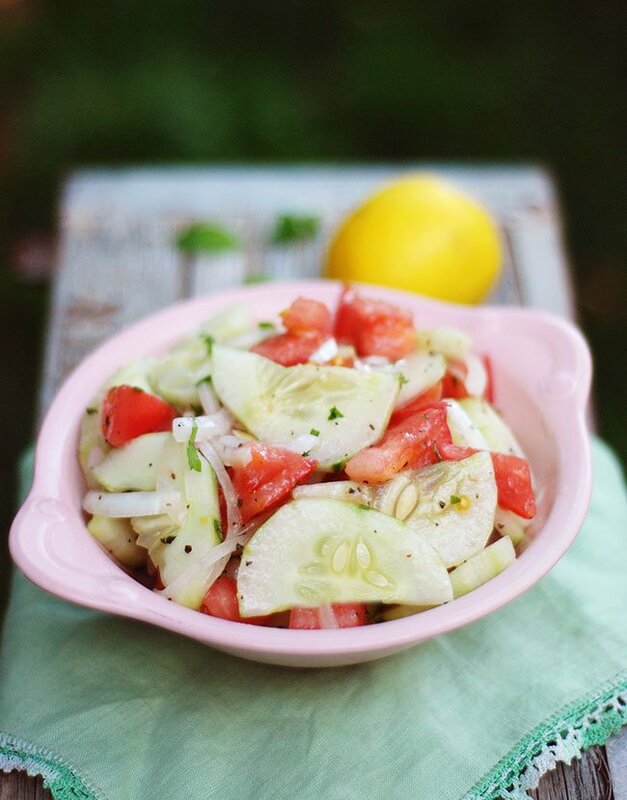 Combine cucumber, tomatoes, onions and herbs in a bowl and toss with dressing. There are so many things to love about summer but fresh-picked, garden veggies and herbs are one of summer’s sweetest little treasures. This herbed cucumber and tomato salad is something I look forward to as soon as gardening season hits. It’s so easy and healthy and DELICIOUS!!! If you find yourself with so many tomatoes and cucumbers you don’t know what to do with them all, and you’re not really wanting to go to great lengths to turn them into a culinary masterpiece… Well then, this very simple herbed cucumber and tomato salad is just the thing you need to make. It makes a delicious side dish that goes with just about any meal. I love to throw this together for weeknight meals. I always make a big batch because it stores well for a few days in the fridge. The combination of basil and mint in this homemade honey-lemon vinaigrette is what really makes this cucumber and tomato dish really come together. The vinaigrette dressing is a great little back-pocket recipe of mine that goes well on traditional salads and pasta salad too. Check out my orzo pasta salad that incorporate this dressing if you’re a fan. One of my favorite ways to make and store homemade dressings is using a Mason jar. I just add all the ingredients, shake it up and then pour. I bought some pour caps so that I can make a big batch of dressing and pour out just what I need, then store the rest.